I have been told now six times, by six different tangueros, that I seem to follow better on a crowded floor. 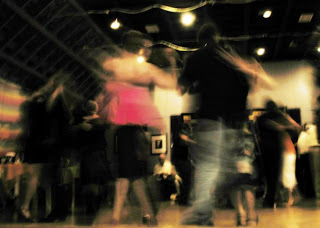 The observation doesn't surprise me since I certainly feel more cozy, connected, immersed, in a crowded milonga - getting to this point, however, surprises me a lot. The reason for improvement in my following may be as simple as less room to dance means a smaller, more limited vocabulary of steps. I can relax a little more because the chances of someone leading high boleos and such decreases dramatically. I can settle in. Tight spaces mean more walking, more turning, a closer embrace - all the things I love most in tango. Seems straightforward enough, doesn't it? Except this is totally new territory for me. Eight months ago I jumped at my own shadow. People approaching me from the side made me flinch. Some of that was due to very poor depth perception and an inability to judge a person's distance from me - particularly from my peripheral vision. And some of it, maybe a lot of it, came from a difficult personal history. Crowds were the opposite of safe. Being approached (especially abruptly) by men I didn't know, was the opposite of safe. When I entered a room, I would skirt the edges (usually to the right side because my vision is better on the left) and take a seat as close as I could to a wall. A ritual of safety. In the beginning, tango classes were a tremendous challenge to my comfort zone. I couldn't go to the edges of the room when the class was taking place in the middle. Nowhere to go. Surrounded by people I didn't know, I had to battle freezing up constantly. In the middle, people all around me, learning to embrace total strangers. Making mistakes. Feeling embarrassed. Exposed. Crowded. My muscles would ache from being held rigid the duration of the class. Yet here I am. Eight months later. I hadn't even noticed arriving at this place. When did "the opposite of safe" become the safest feeling in the world? When did I start to prefer feeling people on all sides of me? When did I start looking for a close embrace dance as a way to remedy feeling unsafe in the world? I know that the ability to close my eyes, itself a huge challenge, was a big step in toward my feeling safe. Seems counter intuitive doesn't it? The truth is, in tango, your eyes can give you all the wrong information. Especially with my unreliable vision telling me that I was constantly in danger of being run in to. Closing my eyes was the turning point. To close my eyes, I had to trust. I had to trust my safety, to a far larger degree than I ever had, to a stranger. And far more often than not, I was safe. For every rough incident - there were a dozen wonderful, warm, safe experiences. So now I nestle into the crowd. Wrapped up in my partner - warm, safe. Maybe the tangueros are better leaders on a tight floor! I can relate to that. I've always been claustrophobic, and a crowd or crowded place is something I'll hurry to escape from, particularly if it's people I don't know. But when I started tango, social dancing was a priority: I didn't even think about it. Then, after three or four months, nerving myself to go to milongas where I hardly knew anyone, struggling to lead what little I knew in the midst of a determined crowd, I suddenly had a pause moment: how did I get here? What am I doing here? But I knew it was something I simply didn't want to walk/run away from. So I learned how to survive milongas, even those where I don't know many people, because of the deep pleasure of dancing to that music, even in a crowd, perhaps especially in a crowd. At least I've got good peripheral vision, which helps if you're leading! Firstly, bad dancers dance in the middle so they can show off their large moves, so staying in the outside lane is ideal. I had one of my best tango nights one time when the milonga was soooo crowded there was less than 1ft (30cm) to move in any direction. My leaders sweated buckets but I was in heaven - the safety? the movement of the crowd? Tangocommuter - thank you so much for your comment. I'm glad to know I'm not the only who struggled a bit with being comfortable at milongas. I can't imagine trying to lead with my vision - I'd be a menace on the dance floor lol! Londontango - If a leader told me that he prefered to dance small as a general rule, I think I'd develop an instant tango crush. It *is* all about what you can't see! why is so many of the teachers are of the first type?